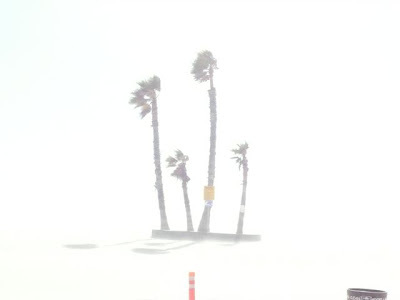 Today, we had a sandstorm by the beach. The Weather Channel predicted 30-40 knot winds. It’s not often that you can’t see the pier or the Pacific any day of the week. Today, no way. In a couple of months, this beach will have a bunch of fit kids put through their paces as Junior Lifeguards. As I glanced at my local Recreation Dept. catalog for spring workshops and classes, I came across the qualifications for entering the Junior Lifeguard Program. Wow, that makes me feel so young. I think my fastest 100-yard interval last year was about 1:47. I made some tweaks to my stroke and my turns last fall, so I hope I would fall in the pre-teen category by now. But I’ve yet to really test myself lately. Now I have a whole new group of athletes to look up to – even though most of ‘em are shorter than me.